Home / Community Bloggers / Denim, Dice & Disco Casino Night – NEW DATE! Denim, Dice & Disco Casino Night – NEW DATE! 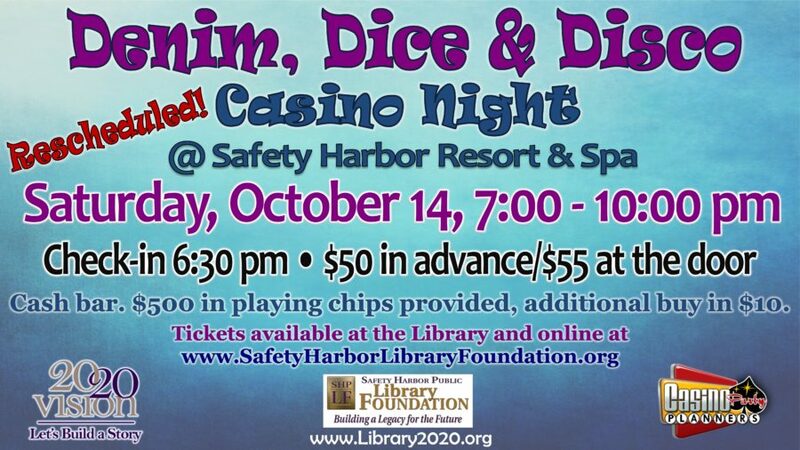 Mark your calendars for Saturday, October 14, 2106, 6:30 to 10:00 pm to attend Denim, Dice & Disco, the Safety Harbor Public Library Foundation’s annual fundraiser for their 20/20 Vision – Let’s Build a Story Capital Campaign. This unique Casino Night at the Safety Harbor Spa, includes casino games, silent auction, prizes, 50/50 raffle, music and hor d’oeuvres. A cash bar available. Tickets are $50 cash or check advance purchase at the library, $52 online https://sendomatic.com/CasinoNight, or $55 at the door. Special thanks to our table sponsors for making this event a success. For more information on the Foundation, please visit www.SafetyHarborLibraryFoundation.org. Questions on the event? Please call Lisa, 727-724-1525 x4106.